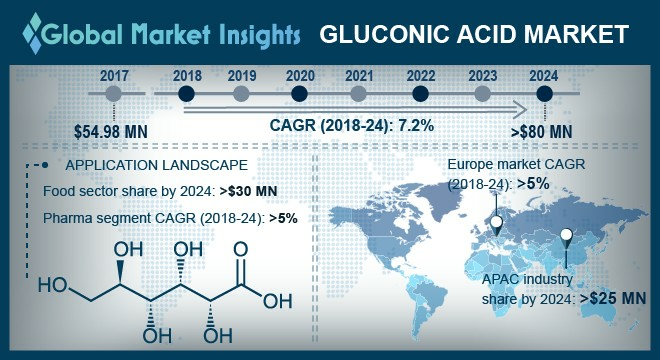 Gluconic Acid Market size is set to surpass USD 80 million by 2024; according to a new research report by Global Market Insights, Inc. Growing penetration of global brands along with escalating demand for personal care and food products owing to growing heath consciousness will drive gluconic acid market size. These bio-based acids are mixed with food products to be used for pickling. Growth in consumer spending on RTE and convenience food products owing to changing lifestyle supported by increasing economic standards population is likely to foster product demand. UK market size from meat application is likely to reach 3.5 kilo tons due to its extensive usage as pH regulator for fermented salami and its application as a color enhancer. It is used in food processing in the removal of glucose prior to the preparation of products to reduce the nonenzymatic browning. It is also used in removing residual oxygen from dehydrated packaged foods including meat. Stable consumption of lamb, pork and beef, which have been important food items in British diet is likely to drive product demand in the forecast timeframe. U.S. market size from pharmaceutical application may surpass USD 1.5 million by 2024. Growing medical spending along with large scale pharma industry in the region is likely to impel product demand in the projected timeline. Product innovation along with extensive R&D assistance for bio-based acid production will boost market size in the projected timeframe. Additionally, supporting regulatory amendments from European Union pertaining to approval of gluconic acid to be used in food & pharmaceutical products may contribute towards industry growth. Gluconic acid is a mild organic acid which is non-corrosive and non-toxic in nature. It is a resultant of glucose done by oxidation reaction. Numerous salts can be derived using this product including potassium gluconate, sodium gluconate and calcium gluconate. These products have application like reduction of fat absorption in doughnuts and cones along with usage as flavoring agent in numerous food items, which may stimulate product demand. Major companies are formulating cost effective and ecofriendly production techniques with safer and effective method for manufacturing product. its usage as cleaning formulators for eliminating labels and calcium scales is projected to stimulate gluconic acid demand by 2024. Price volatility in the raw material including glucose along with high cost of production and low yield may affect gluconic acid market price trends, thus affecting industry profitability. China market size from industrial application may witness gains of over 5.5 % in the forecast timeframe owing to the growth in textile industry. These products are extensively used in textiles productions as stabilizing agents in bleach baths and dye baths. Gluconic acid is used in cleaning products to dissolve mineral deposits particularly in alkaline solution, which is anticipated to drive product demand by 2024. Calcium Gluconate in the form of gel is used to heal burns caused by HCL, calcium gluconate vaccinations are used for severe cases for avoiding deep tissues necrosis, thereby driving industry growth. New product formulation and high demand for bio-based chemicals in industrial cleaners and surface care applications is projected to drive industry growth over forecast timeframe. Growing financial standards along with increasing consumer consciousness regarding safe personal care product is likely to boost gluconic acid market growth. Global gluconic acid market share is competitive and moderately fragmented with key industry precipitants includes Jungbunzlauer, Roquette, TCI Chemicals, PMP, xzhch, Prathista, Fuso chemical and Toronto Research Chemicals. Growing consumption of bio-based chemicals has encouraged companies to invest greatly in R&D.